Looking for a sophisticated and polished look? Then the Misha is the style for you! 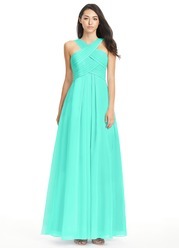 Its pleated halter neckline, smooth bodice and full skirt are sure to have you obsessed with your look. Available in full size range (A0-A30) and custom sizing. Colour and Style on point but it was slightly large. I tried this on as a sample dress along with the Veronica & Natasha. I ordered my samples in early February, received them about a week and a half later & had a week to try them on. Originally ordering multiple samples at the same time was tough availability wise. One item would be available in my size but the other 2 not, then another item becomes available but the first one is gone ect. Had to order 2 in one order then the last one in a separate order. Because of this they arrived at different times so it would have been hard to try them on together to compare styles. 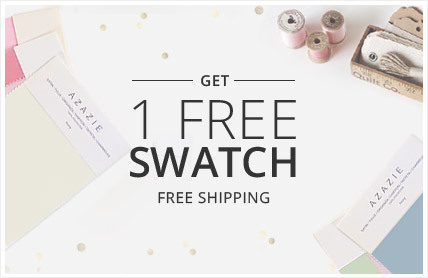 Azazie was great in giving me a few days extension on my first order. Size 10 is true to size, no areas felt too large or tight. If between sizes go by the waist 1st & bust 2nd. Hip measurements don't matter much with the flowing skirt material. I would've been a 6 by bust, 8 by waist & like a 14 by hip guidelines. A10 fit well enough for sample purposes but I will do custom when it is time to order. (it's free and they reimburse up to $50 for alterations so why not!) This dress was my favorite of the 3 mentioned above & I will be doing a custom order with the wedding party soon (will update or add another review in August after the wedding!) Pros: neckline isn't as high as appears (I can't stand chokers or too high of necklines). This is one of the only few dresses Azazie makes that doesn't have crazy amounts of pleated material- this has a very smooth, lightweight and sleek feel vs bulky with the thicker pleated folds in all the other dresses. The thin waist band is very slimming and actually hits at the natural waist (the others with thick waist bands are too high and make the torso look shorter than it is and allows for lower belly pooching). I have a small bust (barely an A) but this made me look like a solid B/C! Cons: No pockets but the dresses that do have pockets tend to make the hips look wider than they are due to the excess material to make them. The straps on the back are sort of stretchy elastic and due to being tried on a lot as a sample were stretched out and didn't lie flat. Could easily be pinched, folded and sewn in alterations. I ordered this sample dress and was pleasantly surprised by how true to size it was! It felt very comfortable and high quality. My one complaint would be that even my strapless bra showed in the back, but there's enough structure and padding in the front to allow me to go braless. I'm fairly short so it could also just be a matter of having it altered to raise the back up a bit to cover a bra. Overall, it's very cute and flattering! I will acknowledge first that I did not pay attention to the size chart and did not know my measurements before ordering my dress and that was my fault. I thought these dresses were according to standard sizing so I ordered an 8, which is usually the size dress I normally wear. The dress arrived about a month after ordering and of course was too small in the waist. The bust however was very big and was awkwardly cone-like due to the boning and padding. I was disappointed by this because I thought these dresses were supposed to look natural without a bra but the boning made the bust look so stiff and awkward. 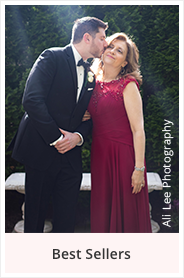 Realizing my predicament with the wedding approaching in a few weeks, I got online immediately to try to contact Azazie and was shocked to find that there was no customer service number or way to get in touch with someone. I had to submit a message request and waist 3-5 days to be contacted, which was very unfortunate due to the urgency of my situation. I was disappointed that this was the case. As far as the dress itself, the quality about matches the price. Very pretty design and color. I cannot stress enough how important it is to have your correct measurements, whether you order by size or custom. I'm afraid I've made my situation extremely difficult for myself due to my error. However I've never worn a bridesmaids dress with such an unusual size chart, which is why I didn't pay close enough attention. 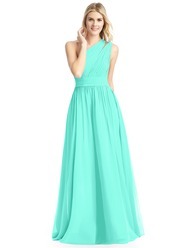 I was somewhat skeptical about ordering this dress for a friends wedding but decided to try it. SO glad I did! The back of the dress is SO flattering and even has rhinestone buttons at the back of the neck. I went with a custom sizing, so it needs a few minor alterations but overall, it fits well. For the price, this dress is a steal! I've never been more satisfied with purchasing a dress before. It's exactly what I pictured and really well constructed. Also, the delivery was fast, and I ordered pretty last minute so I am thoroughly impressed. I got a custom size and didn't need alterations at all. Overall great experience with Azazie! Terrible! The dress fit right, but it didn't fall in the right places. The back of the dress was also awful, the stripes of fabric going down were all loose, not tight against the skin. The halter top didn't fit any of the girls right, and came down lower than in the picture. 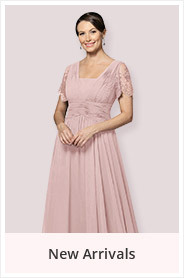 Looks, feels, and fits like a cheap bridesmaid dress. Not surprised, but never what I would pick for my own wedding. I absolutely LOVE this dress! I can wear an 8 but I ordered a size 10 just to be on the safe side and needed very little alterations (I am short so I needed to have it hemmed). I love how this dress looks on me. It is extremely flattering. I am a B but this dress made my bust look wonderful. My waist looks tiny but it also accented my hips. It feels so light but will keep me warm for the wedding in December. The color (burgundy) is gorgeous as well! 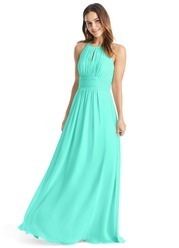 I would definably recommend this dress.